Make-Ahead Meals and Freezer Cooking Really Will Change Your Life. In a Magical Way! First, I need you to understand this. You reap what you sow. Imagine not having to stress about the drive thru total again, or how much food you’ve wasted this year because it went uncooked and spoiled. Imagine being able to pull food from the freezer and not have to think about cooking. You just have to reheat it and maybe prepare some side dishes to go along with it. Imagine getting dinner on the table without stress, and without spending hours standing in the kitchen after a long day. You “sow” a few freezer meals, then you’ll reap oodles of time and less mental anguish over the next 2 weeks, when you don’t have to worry about dinner. MyFreezEasy makes the sowing part super easy with Dump Dinner recipes. These recipes are the easiest meals you will ever put together in your whole entire life. They are called dump dinners because you literally just dump all the ingredients into a bag and go on with your life! No chopping, no fancy ingredients, no fuss, no chef-experience needed. There’s a whole category dedicated to these easy-peasy recipes and you can find them here. Second, and this is important. Mark your calendar. There’s a nifty little fridge magnet you can use for this too! Plan it, post it, and keep the family informed. “What’s for dinner?” doesn’t even need to be grumbled because they can just look at the fridge! You’re welcome, friend! Third, you’ve just got to do it. Just make ten meals. Or even 4 or 6. Just prep them and put them into the freezer. It only takes one hour. A wise woman once said, “If you have time for Netflix, you have time for freezer cooking.” Maybe you could even watch Netflix while you prep your meals. We can coin a new phrase called Netflix & Freeze. Okay, but really. You have time. I know it, you know it, your dog knows it. So, just do it and see for yourself how wonderful having meals waiting for you in the freezer really is! Set aside a few minutes on the weekend or when you have the energy on a weekday evening and package up what you would normally add to the blender in a quart size freezer baggie. Pour some milk or yogurt into an ice cube tray, then freeze. To each make ahead smoothie baggie, add a few cubes of frozen milk or yogurt in with your favorite fruits and freeze it all up! When you’re ready to make your smoothie, just dump it all in, add a little water or juice so it will blend well and puree away! You’ll find some great smoothie recipes at the end of the recipe section of the guide. Use those or your favorite smoothie combinations to make 10-20 packages of Make Ahead Smoothie Mixes at a time. This is a great way to take advantage of sales on produce. You can buy a few extra pineapples when they go on sale for 98¢. Cut them all up and freeze with some bananas and apples or bananas and oranges and there’ll be cheap smoothies ahead for you! If you ever purchase larger amounts of flour, sugar and other baking ingredients from a warehouse store, then it helps to set aside some time to make some baggies with the mixes pre-measured out. Then you just dump and add the egg, oil, milk and other liquid ingredients for baked goods like pancakes, waffles, muffins, etc. While it takes a few minutes to measure everything out, it sure makes a huge difference on those busy afternoons to have everything pre-mixed and ready to dump. Because when you have little ones under foot or work full time or are going through a tough time in life, every minute in the kitchen counts! These baking mixes can be stored in the pantry if they are sealed well, but when I make a huge batch of them I prefer to store them in the freezer. I roll up the labeled bags and place them in a plastic container that fits in my deep freezer with the label facing up. Then I can quickly grab what I need and get to making it. I would challenge you to utilize the freezer as a money saving tactic. As you watch the sales and prices at the grocery store, please start stocking up on the meats and veggies when you see them on sale. When you see boneless skinless chicken breast on sale for $1.99/lb., I beg of you to please buy enough packages to last until the next sale (usually 6-8 weeks later!) While every grocery store’s sales cycle differ slightly, if you watch your stores closely, you’ll start to notice a pattern of when they offer best prices on meats. As you slowly begin to fill your freezer with meats and veggies, you’ll discover a shift in the way that you grocery shop and plan your meals. Instead of planning then shopping, you’ll find yourself shopping, filling your pantry and freezer, and THEN planning your meals based on what you purchased at rock bottom prices and what you have in your house! While both options, meal planning then shopping & shopping then meal planning, are great money saving strategies, I have found that shopping the sales and stocking up, then planning around what you have on hand is the best way to save more money in the long run. Week 1 – chuck roasts and split chicken breasts are on sale. Organic baby carrots are on sale, as are yellow onions and sweet potatoes. Shopping Plan: Purchase 3-4 roasts, 3-4 packages of split chicken breasts, 3-4 bags of baby carrots, an extra bag of yellow onions, and triple the amount of sweet potatoes you would normally purchase. Freeze Plan: Marinate the beef roasts & chicken pieces, or just freeze them and marinate later. Freeze the baby carrots to use in soups or stews. Chop up or slice and freeze the extra bag of onions to use in soups, stews, sauces and fajitas. Make a triple batch of mashed sweet potatoes and freeze what you don’t eat for dinner that night. Week 2 – Pork chops are on sale, as are celery and the last of the strawberries for the season. Shopping Plan: Purchase 3-4 packs of pork chops, and extra stalk of celery, and as many strawberries as you can fit into your budget. Freeze Plan: Marinate the pork chops, or just freeze them and marinate later. Chop up the celery and freeze in 2 cup portions to use for soups, stews and casseroles. Remove the stems from the strawberries and flash freeze (details in Freezing Tutorials section) to use in smoothies later. Week 3 – it goes on and on. 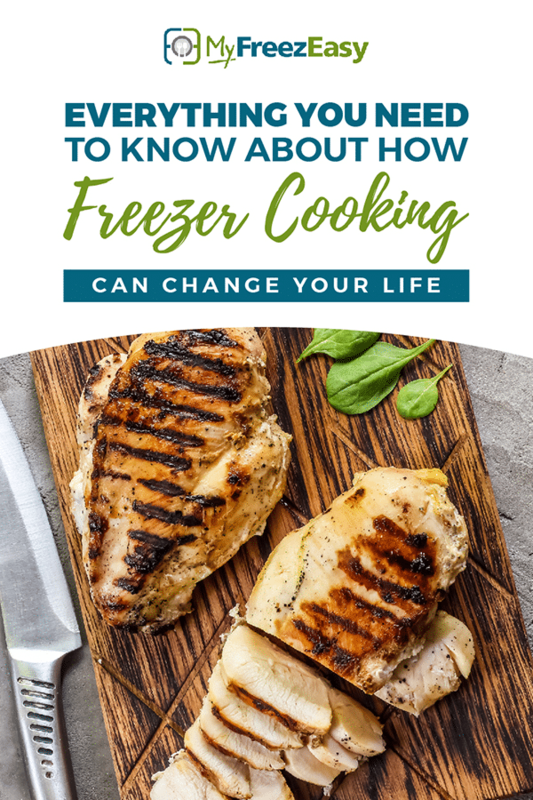 After a few weeks, you’ll have all kinds of food in your freezer and pantry to start making up meals. Eventually your shopping list will be just fresh produce, dairy and bread. Then, you’ll need to purchase more meat when it goes on sale again and keep the rotation going. Just remember to keep enough on hand for what your family needs. 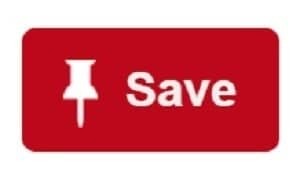 Over time, you’ll fall into a nice rhythm and will enjoy all kinds of savings, too! 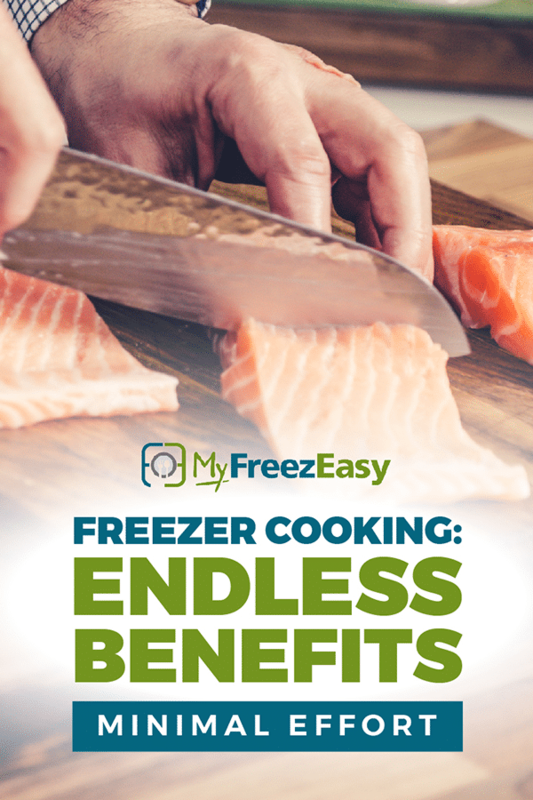 MyFreezEasy offers monthly themed meal plans for “All Chicken Recipes” and “All Ground Beef Recipes” and “All Pork Recipes” so that you can make meals for your freezer with the meat that’s on sale at your grocery store. We update these every month with new recipes. Keep scrolling to get a copy of this month’s all meat plans! The potatoes were sweet, but so was the deal. Sweet potatoes were NOT on my list…but they were quickly added to my list when I saw that they were $.12/lb. (Yes, you’re reading that right!) That’s 22 lbs for $2.66!!! Also, they had some from a local farm that were ginormous! I quickly decided to grab as many as would fit into the top of the little cart and ended up with 12 giant sweet potatoes. You buy as many as you think you can handle, then cook and freeze them. This is how “$5 Dinners” works…I now have 6 hefty side dish servings that cost me a total of $.30 each. Doing this helps me keep the overall meal costs LOW, and I don’t have to fuss about cooking these later (other than reheating!). Win-Win! I only cooked 8 of the 12 for the freezer…the rest we used for our holiday meal!. Read my step by step sweet potato journey here. This is how my love of freezer cooking started! This is where the magic happened. I wanted to save money, so I created my own freezer meal plans using only bulk ingredients. These plans went crazy on the internet and you can still find them in our online store today! 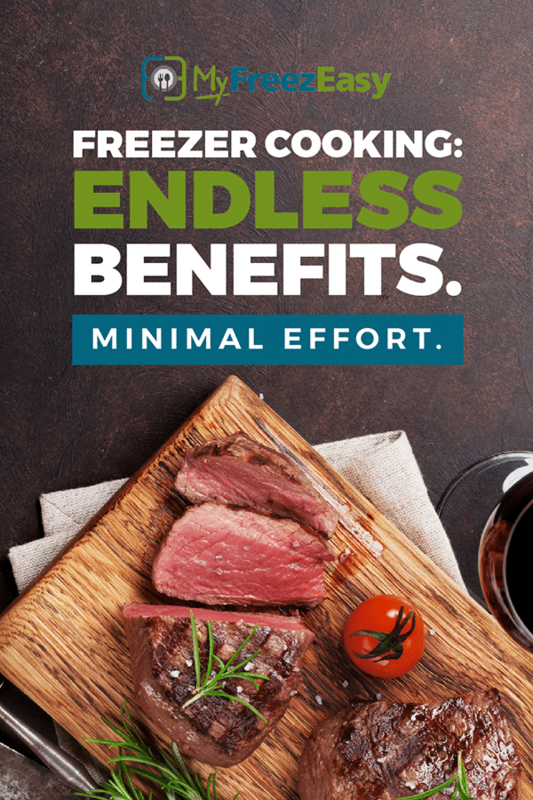 Freezer cooking allows you to utilize bulk prices, because with your freezer meal plan you are confident all of it will be used in meals. Goodbye food waste, overspending, and stress! Hello confidence! Freezer cooking requires very minimal kitchen skills. Instead of cooking, you could really think of it as tossing ingredients together. Anyone can do it, you don’t need a chef hat. You toss together a few ingredients, yet the end result looks impressive and even tastes good. Maybe even great! You don’t need special ingredients, labor intensive recipes, or fancy chopping skills to get a delicious, wholesome meal on the table. 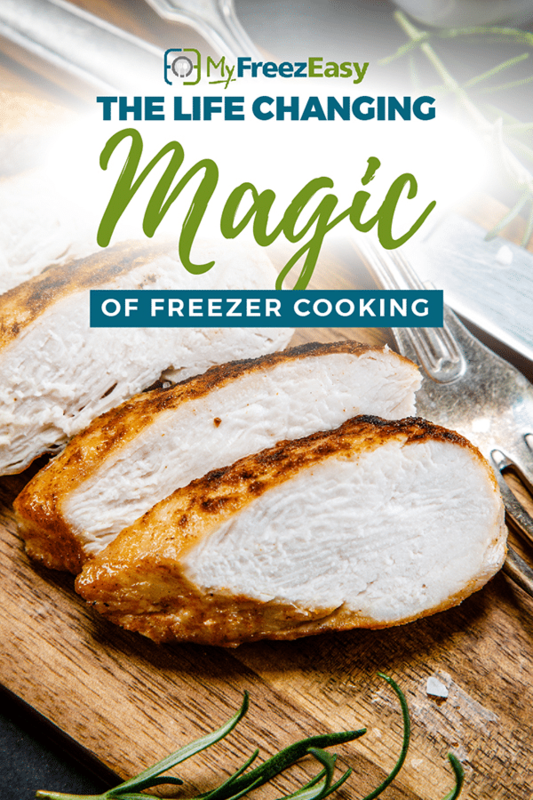 Freezer meals provide an easy, achievable way to feed your family wholesome meals. Not only are the wholesome, but you will have the time and energy to actually sit down, enjoy the food and have some real conversations. That’s the ultimate goal, right? Enjoying good food with people you love. 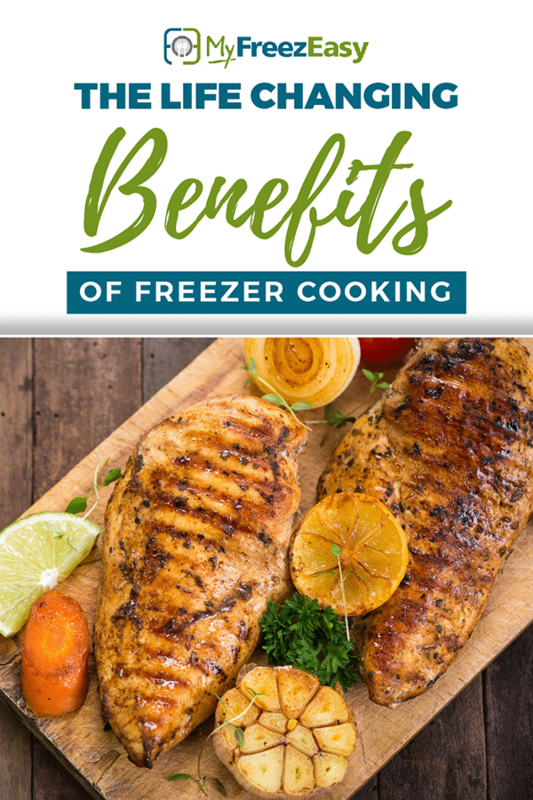 Freezer meals are an essential resource when following a dietary plan or working towards a healthy eating goal. It’s the ultimate way to skip a long list of excuses, because there is always food waiting in your freezer that is compliant to your needs or goals. Freezer meals don’t stop at special dietary needs. You can find plenty of recipes that fit even the most unique diets. Having meals already put together removes the stress of dinnertime. Meals can also be portioned out as needed, if your family has a variety of different dietary needs and preferences. 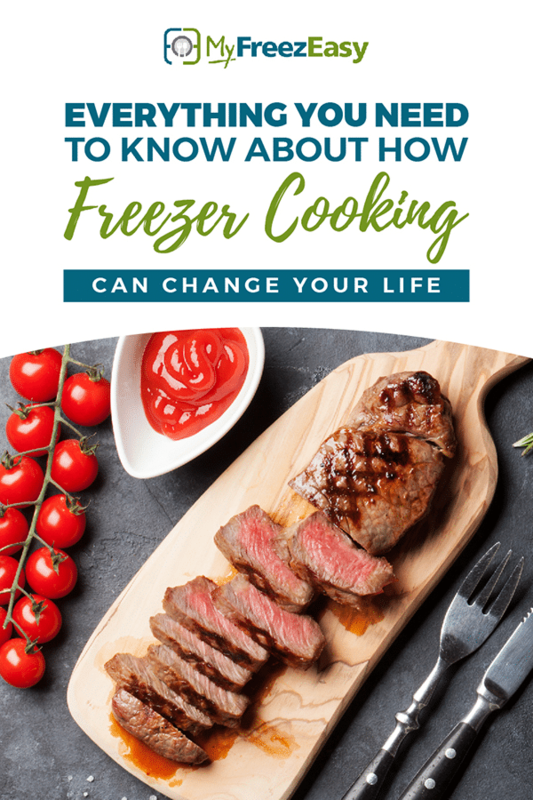 There’s a freezer meal stigma that we need to talk about. It has to do mushy casseroles, and it needs to stop. 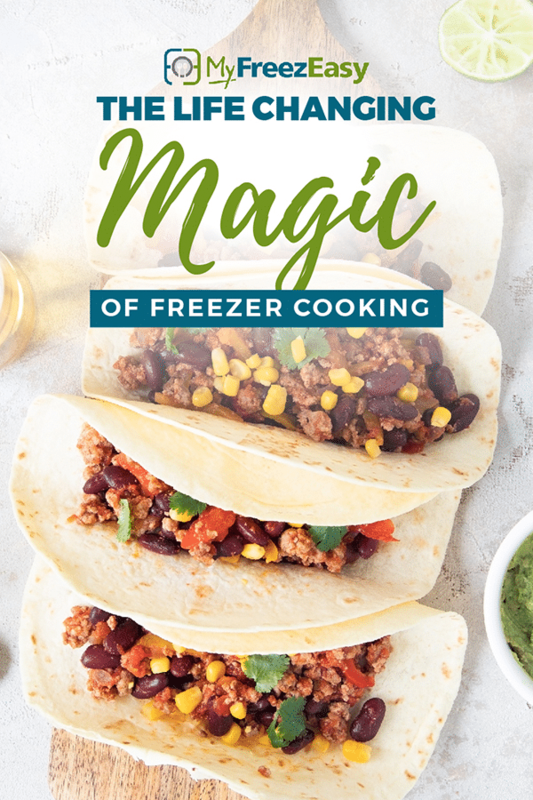 The point here is, freezer meals are not just mushy casseroles or gooey slow cooker dishes full of cream of mushroom soup. Freezer meals can be literally anything your heart desires. You can feed all kind of people, in all kinds of ways. Picky eater? There’s a freezer meal for that. Unexpected guests coming over for dinner? There’s a freezer meal for that. Following a strict diet? You guessed it, there’s a freezer meal for that! It’s Thursday. And it’s going to be a great day. I get the kids dropped off at school on time. With full lunch boxes and water bottles. And I manage to squeeze a few hours of work into the morning, complete with blog post writing, conference calls and new team member set up. I’ve enjoyed my salad for lunch and then the call comes in…”ELEMENTARY SCHOOL” flashes on my phone. It’s never good when the school calls you. Stitches are in order after a fall on the playground at recess. I scoop up the baby, call my mom to see if she can pick up the preschooler, and make my way to the school to pick up the older 2 kids and head to the pediatric urgent care. It wasn’t a major cut, and I didn’t feel the need for a trip to the hospital emergency room. I figured I’d have a shorter wait (and drive) if we went to the nearby urgent care. Also, I had to figure in a trip to the drugstore for the gauze and bandages that we will need for the post-stitches care. By my calculations, it would be dinner time by the time all this was said and done and I would be completely depleted of all energy from keeping the little folks busy and occupied for hours at the urgent care & drugstore. I wasn’t planning on this little afternoon adventure so I didn’t start the slow cooker earlier in the day. Rather than call for takeout and spend more $$ than I needed to for the day (urgent care co-pay plus drugstore stop = expensive! ), I texted my husband and asked him to pull out some sloppy joe meat and slider buns from the freezer. I told him how to quickly thaw the cooked meat and sauce and reheat it, and when we arrived home the house smelled amazing with the sloppy joe meat gently bubbling on the stove top. We avoided a $40 restaurant bill on a weeknight when we didn’t need to be spending money on take out. We all have those days. I have them more often than I prefer, but that’s life. It’s busy, it’s fast, it’s hectic, and sometimes it needs stitches. It helps having backup on these days. Specifically, food-in-the-freezer type backup. And this is what I love about freezer meals. They not only help on afternoons like the ones described above, they also help cut down on overall time spent in the kitchen, and save me just enough mental and emotional energy to get through the dreaded late afternoon witching hour when everyone needs my attention. I’ve always said that being one step ahead of yourself when it comes to meals – both cooking and planning them – can do wonders on saving time, money and shreds of sanity.